When we say it will leave her breathless, we''re not exaggerating. 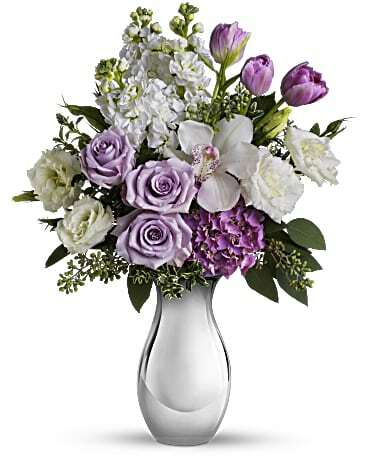 She''ll be swept away by the lush lavender roses, white orchid and other fabulous favorites in a Silver Reflections vase. The exquisite bouquet includes a white cymbidium orchid, lavender hydrangea, lavender roses, white lisianthus, purple tulips and white stock accented with fresh greenery. Delivered in a Silver Reflections vase.